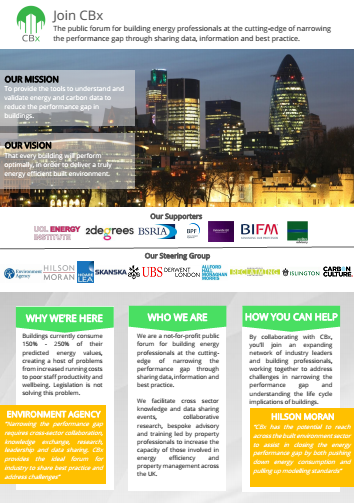 CBx is supported by the UCL Energy Institute and the UK’s leading property and building energy performance organisations. That every building will perform optimally, in order to deliver a truly energy efficient built environment. Briefings and events - cross-collaborative discussions providing a unique understanding of how different sectors perceive barriers and solutions to specific energy performance issues. We facilitate cross-sector knowledge and data sharing events, collaborative research, bespoke advisory and training led by property professionals, to increase the capacity of those involved in energy efficiency and property management across the UK.